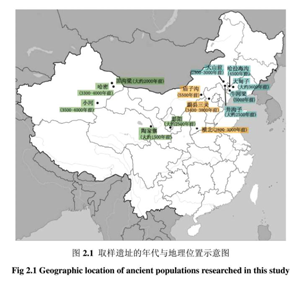 Jilin University recently published an ancient DNA study on Chinese Y-chromosomes. It features 119 samples from 13 archaeological sites in northern China. That's quite impressive considering that aDNA is extremely difficult to extract from Y-chromosomes. A paper from 2010 on the Tarim Basin or Xiaohe mummies listed seven R1a1a results, while here we have 11, plus a K*. So it looks like at least some of these are from newly tested Tarim Basin samples.